The Commissions and Boards line item subsidizes the work of the Agricultural Commission, the Marketing and Bargaining Board, the Michigan State Fair Board, and the Upper Peninsula State Fair Board. The Agricultural Commission is a five-member bipartisan group of citizens appointed by the governor and subject to Senate confirmation. Members serve four-year staggered terms. By law, not more than three members may be of one political party. The commission appoints the director of the MDA and approves all rules and regulations promulgated by the MDA. The Marketing and Bargaining Board administers Public Act 344 of 1972, which permits producers of perishable fruits and vegetables to be represented in negotiations for the price of commodities by an accredited agricultural association. Functions of the board include: determining the definition of a commodity bargain board unit, administering accreditation procedures, determining members of the accredited bargaining units, and protecting the rights of both growers and handlers. The State and Upper Peninsula Fair Boards oversee the operations of their respective fairs. The MDA should be restructured according to the design of many other departments of state government, which do not have commissions to oversee department management. This could be accomplished in part by eliminating the Agricultural Commission, allowing the governor to choose the director, and granting the director the responsibility for setting department policy. The Marketing and Bargaining Board should be eliminated, and its functions handled by the private sector. Both the producers and the processors of fruit and vegetables have every incentive to make sure that their negotiations over the price of their products go smoothly and without error. There is no reason to believe that agricultural producers, wholesalers and processors are any less able to conduct commerce than producers, wholesalers and processors of other goods. State funding of the fair boards should be eliminated along with state funding of the fairs themselves. There is no reason to maintain them once the fairs are privatized (see recommendation on pages 10). Savings: $63,300. 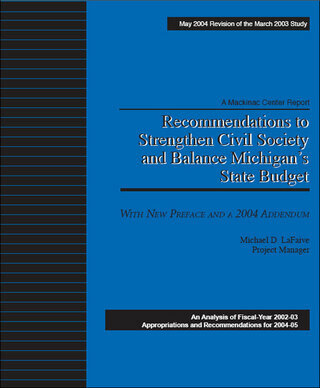 Governor Granholm’s 2005 proposal decreases the gross appropriation to $53,300. The state could extricate itself from its agreement with the USDA immediately. The functions associated with the agreement, if necessary, can be handled by the agriculture industry itself. Most non-agricultural industries provide market information without government assistance. There is no reason to expect any less from the agriculture industry. Indeed, private organizations exist in almost every area of commerce to survey producers and consumers and develop detailed and reliable market and safety information of the same kind provided for the agriculture industry through the SRS. This is true in every industry, from automobiles, computers and telephones, to snack food and insurance policies. Indeed, both government and business routinely rely on private statistical survey research organizations, such as the Rockville, Md.-based WESTAT, or Mathematica, Inc., of Princeton, NJ. There is no reason to believe that the Michigan agricultural industry or federal and state governments could not look to organizations such as these for data collection and distribution. Savings: $326,500. Governor Granholm’s 2005 proposal increases the gross appropriation to $342,200.